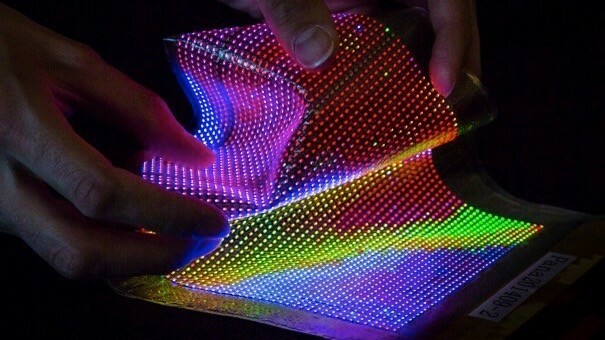 Researchers at Holst Centre in The Netherlands have figured out how to make stretchable, conformable, thin-film transistor (TFT) driven LED display that is laminated into textiles. What that means in layman's terms is a fabric, of sorts, that displays hundreds of LED lights. The research and development group at Holst Centre, in collaboration with imec (a nanoeletronics research firm) and CMST (Imec's associated lab) has devised a way to integrate LED displays into a polyimide substrate that is encapsulated in rubber, which allows the displays to be laminated into fabric. On the surface, this new technology seems very niche, and already exists in some form or another. You've probably already seen those light-up sound activated LED t-shirts at gimmick shops (or on that one dude at the party). The difference with Holst Center and Imec's research is that the electronics are integrated with the textile, instead of sitting on top of it like an iron-on patch. The research group actually hopes that their technology will go beyond brightly coloured t-shirts or hats with turn signals on them for bicyclists. The idea is that this will pave the way for more convenient healthcare and activity tracking wearables. If a person doesn't have to remember to put on an activity tracker like a health band, but simply gets dressed in the morning, than it increases the data collected, which improves tracking results. Flexible tech research is a growing industry. We've seen such things as electronic skin sensors and a fitness band-aid. The smart clothing market is full of unique connected wearables. By integrating wearable tech seamlessly into clothing, the researchers hope to make activity tracking less obtrusive and more accurate.